I feel like I haven't wrote a "real" blog post in a long time! I haven't had as much crafty time...well that is a total understatement...I have had NO crafty time since the beginning of April with all the personal things we went through and trying to keep things together and running. Now that things are more back to normal and I can try and get on a routine I am hoping to remedy my no crafting slump this week so wish me luck! LOL! One thing that I thought would be fun to do is have a "WOW WEDNESDAY" each week. Our design team is so phenomenally talented and I am always so grateful for all the ladies on our team and the ones that have been with us and moved on, I just can't even tell you. These ladies put in a lot of hard work and I could literally spend hours just going back through all of the team designs and oooohing and ahhhhing - LOL! Sooooo I thought that if I loved seeing the "Blasts from the Pasts" from our Design team ladies, then you might as well! Each Wednesday I am going to share a few favorite projects that one of our design team ladies have created with you. It could be from one of our current design team members or a past member, might be one project or a few...but they will always blow your socks off :) I think it will be a fun feature and I hope you all enjoy seeing these past stunners as well! Today's projects were all designed by the mega talented Marcy Dangcil. I call Marcy our Queen of Girlie Projects because she always does the most beautiful projects filled with lots of bling, pearls, lace, flowers, and all those pretty things us girls love :) I have recently added the newest release from the Prima Mixed Media Doll Collection by Julie Nutting to the store and so I thought it would be fun to check out some of the gorgeous tags and mixed media canvas projects that Marcy created using these fun Prima Doll Stamps! 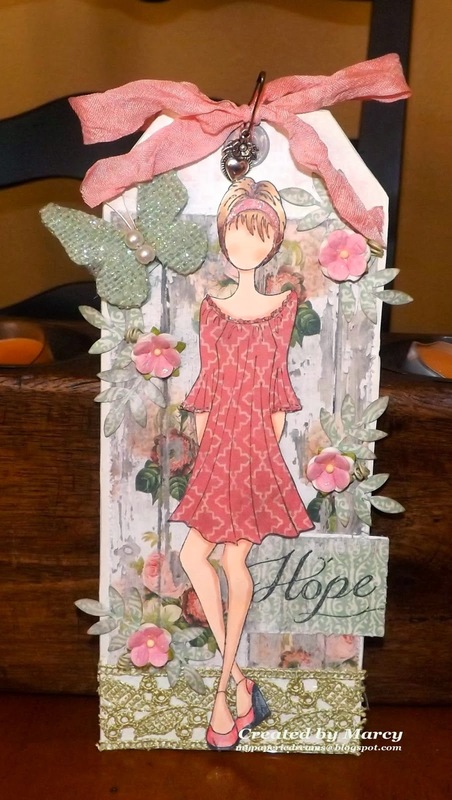 This gorgeous tag was created for our Anything Goes Challenge #102 using the Prima Doll With Strapless Dress stamp. 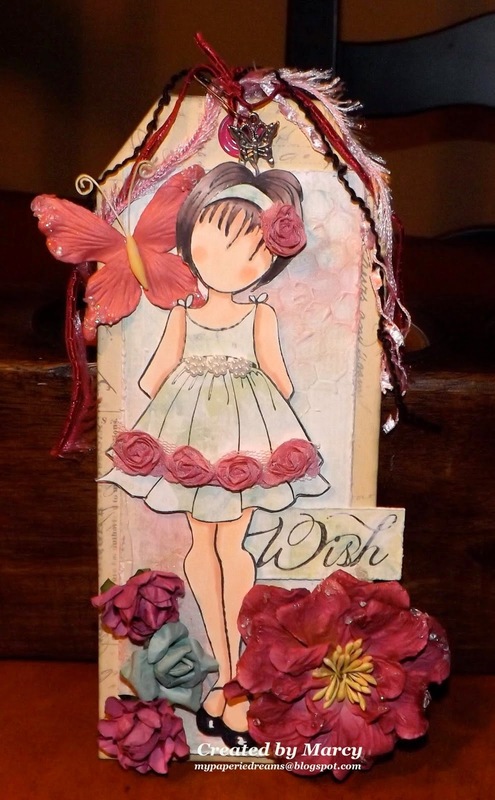 This beautiful tag was created using the Doll With Ruffle Dress stamp for our Anything Goes Challenge #64. I LOVE how Marcy added the little rose trim to the dress and one for her hair! How gorgeous and girly is this tag?!?!? I love the lace trim and flower bead trim on the dress, the lace bow, all the gorgeous flowers....everything - LOL! This is the Riley Doll stamp and Marcy also used the Wings stamp set that is created to use with these dolls as well. 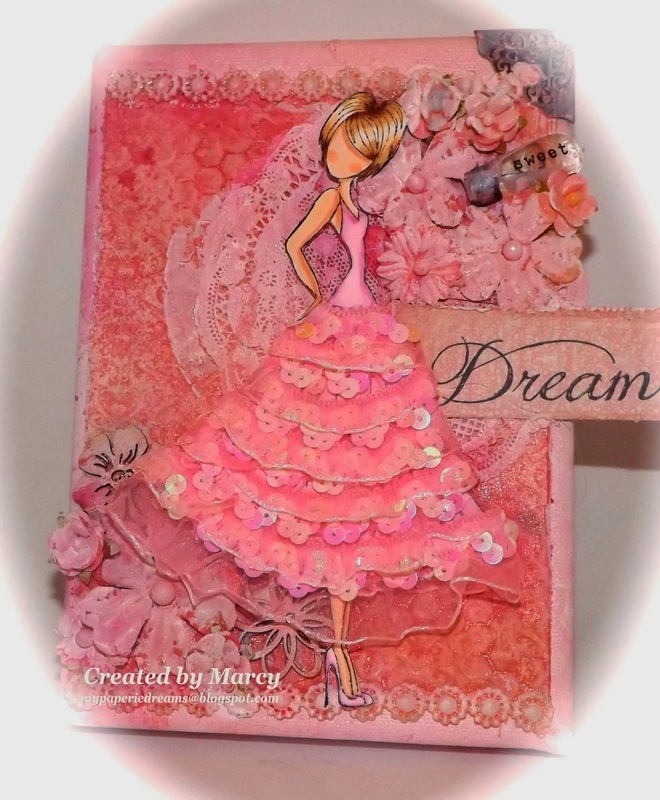 Marcy created this gorgeous tag for our Anything Goes Challenge #81. She has some close up pictures on her blog post here if you want to check those out! I really love the colors in this tag and her paper pieced dress is so pretty! This gorgeous tag was created using the Doll With Peasant Dress stamp for our Anything Goes Challenge #72! 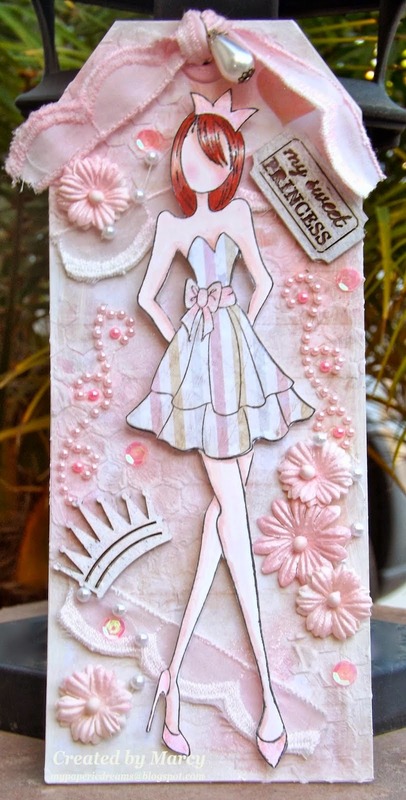 And.... last but not least.... this breath taking Mixed Media Canvas using the Prima Doll With Swing Dress! Wouldn't this look amazing hanging on your wall or displayed on a shelf? I LOVE the sequin trim dress - how GENIUS! Such a stunning project! They are all stunning and extremely Girly! She definitely dresses them up to look their best. Love them all! All fabulous and unique! Love Marcy's work a lot.A real inspiration for us all! These are totally cute. I cannot wait to learn how to play with these! Happy Birthday with Balloon Kaylee! A fun birthday card using distress inks!